Since 1979 we have provided the highest quality service and products. We specialize in custom made window treatments for virtually every application. 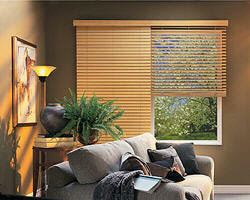 Manual or motorized, blackout or sheer, we have the answer to your window treatment needs. From individual jobs of 1-2 blinds to high-rise office buildings with thousands of windows, we are your one stop shop for mini blinds, wood blinds, vertical blinds, pleated shades, blackout shades, solar shades and the entire Hunter Douglas line of specialty window coverings, including Duette, Silhouette, Luminette and Vignette.Most of our products can be integrated to work with home automation systems. Please enjoy your visit to our web site and be sure to Contact Us if you would like to ask a question, receive a price quotation, or place an order. Please call us toll-free at (800) 704-5111.